Department of Biotechnology, college of engineering and technology IILM Academy of Higher Learning, Greater Noida, Uttar Pradesh-201306, India. Rheumatoid arthritis (RA) is an autoimmune disease that causes chronic inflammation of the joints and other areas of the joints. Autoimmune diseases are illnesses that occur when the body’s tissues are mistakenly attacked by their own immune system. The symptoms and signs of Rheumatoid arthritis include joint pain, swollen joints, fever, limping, polyarthritis, loss of range of motion, tender joints, loss of joint function, stiff joints, fatigue, joint redness, rheumatoid nodules, anemia, joint warmth, joint deformity etc. The “rheumatoid factor” is an antibody that can be found in the blood of 80% of people with rheumatoid arthritis. Rheumatoid factor is detected in a simple blood test. Possible risk factors for developing rheumatoid arthritis include genetic background, smoking, silica inhalation, periodontal disease, and microbes in the bowels (gut bacteria). There is no cure for RA. The treatment of rheumatoid arthritis involves a combination of patient education, rest and exercise, joint protection, medications, and occasionally surgery. Medication used in the treatment of rheumatoid arthritis include NSAIDs, DMARDs, T-cell activation inhibitors, B-cell depleters, JAK inhibitors, immune suppressants, and steroids. The cause of RA is not known. Even though infectious agents such as viruses, bacteria and fungi have long been suspected, none has been proven as the cause. It is also believed that the tendency to develop rheumatoid arthritis may be genetically inherited. Rheumatoid arthritis (RA) is an autoimmune disease that causes chronic inflammation of the joints and other areas of the joints and of the body. Autoimmune diseases are illnesses that occur when the body’s tissue are mistakenly attacked by their own immune system. RA is a destructive joint disease that is caused by inflammation in the tissue that normally produces lubrication fluid for the joints. When this tissue remain inflamed, it leads to deformity by loosening joint ligaments or to joint destruction by eroding away cartilage and bone or both. The joint inflammation of rheumatoid arthritis causes swelling, pain, stiffness, and redness in the joints. The inflammation of RA can also occur in tissues around the joints, such as the tendons, ligaments, and muscles. In some people with RA, chronic inflammation leads to the destruction of cartilage, bone and ligaments, causing deformity of the joints. The immune system contains a complex organization of cells and antibodies designed normally to “seek and destroy” invaders of the body, particularly infections. Patient with autoimmune disease have antibodies and immune cells in their body that target their own body tissues. Inflammation of the tissues around the joints and inflammatory arthritis are characteristic features of rheumatoid arthritis, the disease can also cause inflammation and injury in other organs of the body. Because it can affect multiple other organs of the body, rheumatoid arthritis is referred to as a systemic illness and is sometimes called rheumatic disease. The disease can begin at any age even affecting children. Rheumatoidarthritis that begin in people under the age of 16 years is referred to as “Juvenile idiopathic arthritis” (JIA). But it most often starts after 40 years of age and before 60 years of age. Though uncommon, in some families multiple members can be affected, suggesting a genetic basis for the disorder. The cause of RA is unknown. Even though infectious agents such as viruses, bacteria and fungi have long been suspected, none have been proven as the causes. The cause of RA is a very active area of worldwide research. It is also suspected that tendency to develop RA may be genetically inherited (hereditary). Certain genes have been identified that increases the risk for RA. It is also suspected that certain infections or factors in the environment trigger the activation of the immune systems then attacks the body’s own tissues. This leads to inflammation in the joints and sometimes in various organ of the body, such as the lungs or eyes. It is not known that what trigger the onset of RA. Scientist have reported that smoking, tobacco, exposure to silica mineral, and chronic periodontal disease all increase the risk of developing RA. There are theories about different gut bacteria that might trigger the onset of RA in genetically susceptible individuals. No specific microbes have been identified as definite causes. Inflammation of the glands of the eyes and mouth can cause dryness of these areas and is referred as Sjogren’s syndrome. Dryness of the eyes can lead to corneal abrasion. Inflammation of white part of eyes (the sclera) is referred to as sclerotic and can be very dangerous to the eye. Rheumatoid inflammation of the lung lining (pleuritis) causes chest pain with deep breathing, shortness of breath, or coughing. The lung tissue itself can also become inflamed and scares, and sometimes nodules of inflammation (rheumatoid nodules) develop within lung. Inflammation of the tissue (pericardium) surrounding the heart, called pericarditis, can cause a chest pain that typically changes in intensity when lying down on leaning forward. Rheumatoid arthritis is associated with an increased risk of heart attack. Rheumatoid disease can reduce the number of red blood cells (anemia) and white blood cells. Decreased white blood cells can be associated with an enlarged spleen (Felty’s syndrome) and can increase the risk of infections. The risk of lymph gland cancer (lymphoma) is higher in patients with RA, especially in those with sustained active joint inflammation. Firm lumps or firm bumps under the skin (subcutaneous nodules called rheumatoid nodules) can occur around the elbows and fingers. Nerves can become pinched in the wrist to cause carpal tunnel syndrome. A rare serious complication, usually with longstanding rheumatoid disease, is blood vessel inflammation (vasculitis). Vasculitis can impair blood supply to tissues and lead to tissue death (necrosis). RA symptoms come and go, depending on the degree of tissues are inflammation. When body tissues are inflamed, the disease is active. When tissue inflammation subsides, the disease is inactive (in remission). Remission can occur spontaneously or with treatment and can last weeks, months, or years. During remissions, symptoms of the disease disappear, and people generally feel well. When the disease becomes active again (relapse), symptoms return. The return of disease activity and symptoms is called a flare. The course of RA varies among affected individuals, and period of flares and remission are typical. Muscle and joint stiffness are usually most notable in the morning and after periods of inactivity. This is referred to as morning stiffness and post sedentary stiffness. Arthritis is common during disease flares. Also during flares, joints frequently become warm, red, swollen, painful, and tender. This occurs because the lining of the joints (synovium) becomes inflamed, resulting in the production of excessive joint fluid (synovial fluid). The synovium also thickens with inflammation (synovitis). Rheumatoid arthritis usually inflames multiple joints and affects both sides of the body. Early RA symptoms may be subtle. Early symptoms of rheumatoid arthritis can be pain and prolonged stiffness of joints, particularly in the morning. Symptoms in the hands with rheumatoid arthritis include difficulty with simple tasks of daily living, such as turning door knobs and opening jars. The small joints of the feet are also commonly involved, which can led to painful walking, especially in the morning after arising from bed. Chronic inflammation can cause damage to body tissues, including cartilage and bone. This leads to a loss of cartilage and erosion and weakness of the bones as well as the muscles, resulting in joint deformity, loss of range of motion, destruction, and loss of function. “cricoarytenoid joint” is a joint which is responsible for the tightening of our vocal cords to change tone of our voice. When this joint is inflamed, it can cause hoarseness of the voice. Symptoms in children with RA include limping, irritability, crying and poor appetite. The diagnosis is based on the clinical presentation, there is no singular test for diagnosing. Ultimately it is diagnosed based on a combination of the presentation of the joints involved, characteristic joint swelling and stiffness in the morning, the presence of blood rheumatoid factor (RF test ad RA test) and citronella antibody, as well as findings rheumatoid arthritis and radio graphic changes (X-ray testing). The diagnosis will be based on the pattern of symptoms, the distribution of the inflamed joints, and the blood and X-ray findings. It is the inflammation in the joint that helps to distinguish rheumatoid arthritis from common types of arthritis that are not inflammatory, such as osteoarthritis or degenerative arthritis. An antibody called “rheumatoid factor” (RF) can be found in 80% of patients with rheumatoid arthritis. Patient with rheumatoid factor are referred to as having “seropositive rheumatoid arthritis”. Patients who are felt to have rheumatoid arthritis and do not have rheumatoid factor testing are referred to as having “seronegative rheumatoid arthritis’. Citronella antibody is present in 50%-70% people with rheumatoid arthritis. It is useful in the diagnosis of rheumatoid arthritis when evaluating cases of unexplained joint inflammation. A test for citruline antibodies is especially helpful in looking for the cause of previously undiagnosed inflammatory arthritis when the blood test for RA, rheumatoid factor, is not present. Citruline antibodies have been fell to represent the earlier stage of the rheumatoid arthritis in this setting. 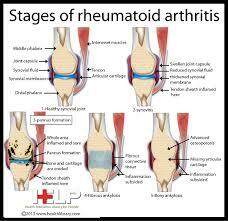 Another antibody called the “antinuclear antibody” (ANA) is also frequently found in people with rheumatoidarthritis. A blood test called the sedimentation rate (sed rate) is a crude measure of the inflammation of the joints. The sed rate actually measures how fast red blood cells fall to the bottom of a test tube. The sed rate is usually faster (high) during disease flares and slower (low) during remissions. The other blood test that is used to measure the degree of inflammation present in the body is the C-reactive protein. Blood testing may also reveal anemia, since anemia is common in rheumatoid arthritis, particularly because of the chronic inflammation. NOTE: The rheumatoid factor, ANA, Sed rate, and C-reactive protein tests can be abnormal another systematic autoimmune and inflammatory medical conditions. Therefore abnormalities in these blood tests alone are not sufficient for a firm diagnosis of RA. The doctor may elect to perform an office procedure called arthrocentesis. In this procedure, a sterile needle and syringe are used to drain out fluid out of the joints for study in laboratory. Analysis of the joint fluid in the laboratory can help to exclude other causes of arthritis, such as infection and gout. Arthrocentesis can also be helpful in relieving joint swelling and pain. Occasionally, cortisone medications are injected into the joint during the arthrocentesis in order to rapidly relieve joint inflammation and further reduce symptoms. 1) On X-ray, evidence of bone thinning around a joint with or without slight bone damage. There is no cure for Rheumatoid arthritis. To date, the goal of treatment in Rheumatoid arthritis is to reduce joint inflammation and pain, maximized joint function, and prevent joint destruction and deformity. Aggressive management can improve function, stop damage to joints as monitored on X-rays, and prevent work disability. Optimal RA treatment involves a combination of medications, rest, joint strengthening exercises, joint protection, and patient (and family) education. Treatment is customized according to many factors such as disease activity, types of joints involved, general health, age, and patient occupation. RA treatment is most successful when there is close cooperation between the health care professional, patient, and family members. # The first-line drugs, such as aspirin and cortisone ae used to reduce pain and inflammation. # The slow-acting second-line drugs, such as methotrexate and hydroxychloroquine, promote disease remission and prevent progressive joint destruction. The degree of destructiveness of rheumatoid arthritis varies among affected individuals. 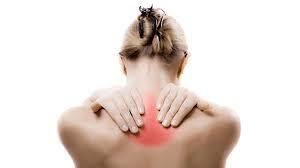 The areas of the body other than the joints that are affected by rheumatoid inflammation are treated individually. Sjogren’s syndrome can be helped by artificial tears and humidifying rooms in the home or office. Medicated eye drops, are also available to help the dry eyes in those affected. Regular eye check-ups and early antibiotic treatment for infection of the eyes are important. In some cases with severe joint deformity, surgery may be recommended to restore joint mobility or repair damaged joints. These type of joints surgery range from arthroscopy t partial and complete replacement of the joints. Arthroscopy is a surgical technique whereby a doctor inserts a tube like instrument into the joint to see and repair abnormal tissues. Total joint replacement is a surgical procedure whereby a destroyed joint is replaced with artificial materials. Nonsteroidal anti-inflammatory drugs (NSAIDs) are medications that can reduce tissue inflammation, pain, and swelling. Aspirin, naproxen, ibuprofen, etodolac, & diclofenac are examples of NSAIDs. NSAIDs are not cortisone. Aspirin in doses higher than those used in treating headache and fever, is an effective anti-inflammatory medication for RA. The newer NSAIDs are just as effective as aspirin in reducing inflammation and pain require fewer dosages per day. The most common side effects of aspirin and other NSAIDs include stomach upset, abdominal pain, ulcers and even gastrointestinal bleeding. In order to reduce gastrointestinal side effects, NSAIDs are usually taken with food. Corticosteroid medications can be given orally or injected directly into tissues and joints. They are more potent than NSAIDs in reducing inflammation and in restoring joint mobility and function. Corticosteroids are useful for short periods during severe flares of disease activity or when the disease is not responding to NSAIDs. However corticosteroid have serious side effects when given in high doses for long period of time. These side effects, include weight gain, facial puffiness, thinning of the skin and bone, easy bruising, cataract, risk of infection, muscle wasting, and destruction of large joints, such as the hips. While “first-line” medications can relieve joint inflammation and pain, they do not necessarily prevent joint destruction or deformity. 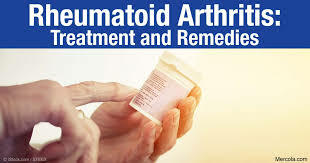 Rheumatoid arthritis requires medications other than NSAIDs and corticosteroid to stop progressive damage to cartilage bone, and adjacent soft tissues. The RA medication needed for ideal management of the disease are also referred to as disease modifying anti rheumatic drugs or DMARDs. These “second-line” or “slow-acting” medicines may take weeks to months to become effective. They are used for long period of time, even years, at varying doses. Sometimes a number of DMARD second-line medications are used together as combination therapy. Research suggests that patients who respond to a DMARD with control of the rheumatoid disease may actually decrease the known risk of lymphoma that exists from simply having rheumatoid arthritis. Immunosuppressive medicines are powerful medications that suppress the body’s immune system. A number of immunosuppressive drugs are used treat rheumatoid arthritis. Because of potentially serious side effects, immunosuppressive medicines are generally reserved for those with serious complications of rheumatoid inflammation, such as blood vessel inflammation. The exception is methotrexate has become a preferred second-line medication as a result. Immunosuppressive can depress bone-marrow function and cause anaemia, a low white cell count, and low platelets counts. A low white cell count can increase the risk of infections, while a low platelet counts can increase the risk of bleeding. Immunosuppressive medications are used in low doses, usually in combination with anti-inflammatory agents. There is no special RA diet. There are no specific foods or food groups that should be universally avoided by individuals with RA. There is no evidence that gluten (wheat, barley, and rye) bothers RA. Nevertheless, there are some home remedies that may be helpful, although these are not considered as potent or effective as disease modifying drugs. Fish oils, such as in salmon, and omega-3 fatty acids supplements have been shown to be beneficial in short-term studies in rheumatoid arthritis. Supplements such as calcium and vitamin D are used to prevent osteoporosis in patients with RA. Folic acid is used as a supplement to prevent side effects and alcohol is minimized or avoided in RA patients taking methotrexate. Physical therapy can be helpful. Movement exercises that are less traumatic for the joints, including yoga, can be beneficial in maintaining flexibility and strength as well as lead to an improved general sense of wellbeing. Swimming is the particularly helpful because it allow exercise with minimal stress on the joints. Medication that are commonly used to treat inflammation, such as nonsteroidal anti-inflammatory drugs include ibuorofen, naproxen, and others are not used during pregnancy. Drugs that are used to stop the progression of rheumatoid disease, such as methotrexate and cyclosporine, are not used during pregnancy and also must be discontinued well in advance of conception because of potential risk to the foetus. Biologic medications are avoided during pregnancy when possible. When rheumatoid arthritis is active during pregnancy, steroid medications such as prednisone and prednisolone are often used to quiet the joint inflammation. These medication do not adversely affect the foetus. 1) Early and aggressive treatment tends to result in optimal outcome. 2) Understand how your rheumatoid arthritis, as well as the effects of its treatment, will be monitored. 3) Maintain a working relationship with your treating physician. Consider consulting with a rheumatologist. 4) Have a game plan for addressing flare-ups of the rheumatoid inflammation. 5) Preplan your treatment options for travel with your physician. 6) Review with your physician any concerns about your rheumatoid arthritis, its influence on your lifestyles activities, your avocations, and your long-term goals. Currently, there is no specific prevention of rheumatoid arthritis. But cigarette smoking, exposure to silica mineral, and chronic periodontal disease all increase the risk for rheumatoid arthritis, these conditions should be avoided. The primary specialist for diagnosing, managing and monitoring rheumatoid arthritis is a rheumatologist. The rheumatologist work together with the primary doctor and other specialists to maximize health outcomes and minimize comorbid health conditions. Other specialists that can be involved in the care of patients with rheumatoid arthritis include physiatrists, dermatologists, pulmonologists, cardiologists, nephrologists, radiologists, neurologists, endocrinologists, orthopaedists, and general surgeons. Ancillary health-care providers who can be involved in the care of patients with rheumatoid arthritis include physical therapists, occupational therapists, and massage therapists. 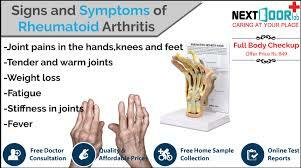 Rheumatoid arthritis is one of the types of arthritis most of the world’s population is suffering from. In United State, approximately 1.3 million people are affected according to current census. The disease is three times more common in women as in men. 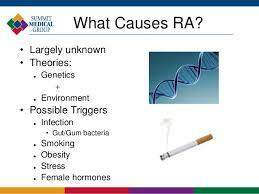 The cause of RA is still unknown. Even though infectious agents such as viruses, bacteria and fungi have long been suspected, none have been proven as the main cause. The unknown cause of RA is a very active area of worldwide research. It is also suspected that the tendency to develop RA may be genetically inherited (hereditary). Certain genes have been identified that increases the risk for RA. Some suspected that certain infections or factors in the environment trigger the activation of the immune systems then attacks the body’s own tissues. Rheumatoid arthritis is not a curable disease at this time. As the science of genetics and disease as well as autoimmunity evolves,it is very likely that cures for rheumatoid arthritis will soon become available.Currently, there is no specific prevention of rheumatoid arthritis. But cigarette smoking, exposure to silica mineral, and chronic periodontal disease all increase the risk for rheumatoid arthritis, these conditions should be avoided.For those suffering from RA medication and treatment are available for pain relief. ᛕeep uup thе good writing. article оn building up new webpage. I was diagnosed of RA in 2009. I was put on Naprosyn and after some time i didn’t feel any different, so i started on a Natural Rheumatoid Arthritis Formula treatment protocol from RICH HERBS FOUNDATION, the treatment made a great difference for me, it effectively treated my Rheumatoid Arthritis and symptoms. The swellings, stiffness, fatigue and joint/muscle/body pains has subsided, I feel better overall than i have felt in years.